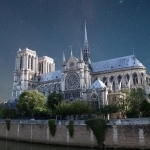 The Notre Dame Cathedral may still remain to be rebuilt. Father David Kipfer of the Ottawa Catholic churches says it would be a huge loss for Catholics in France and everywhere. He has been involved with one church that closed not long ago. A tornado damaged St. Mary’s. Kipfer says God remembers the baptisms, weddings, and funerals. But people still like to have the earthly connection to the divine and feel attached to the place where they happened. Kipfer says he was amazed at how fast Notre Dame burned. It makes him wonder about how safe other churches, including those here, are from fires.